With the release of Open Enterprise Server 2015 by Micro Focus (formerly Novell inc), Micro Focus is giving customers more choice and flexibility through support for AD and increased storage capabilities. What’s new in Open Enterprise Server 2015? 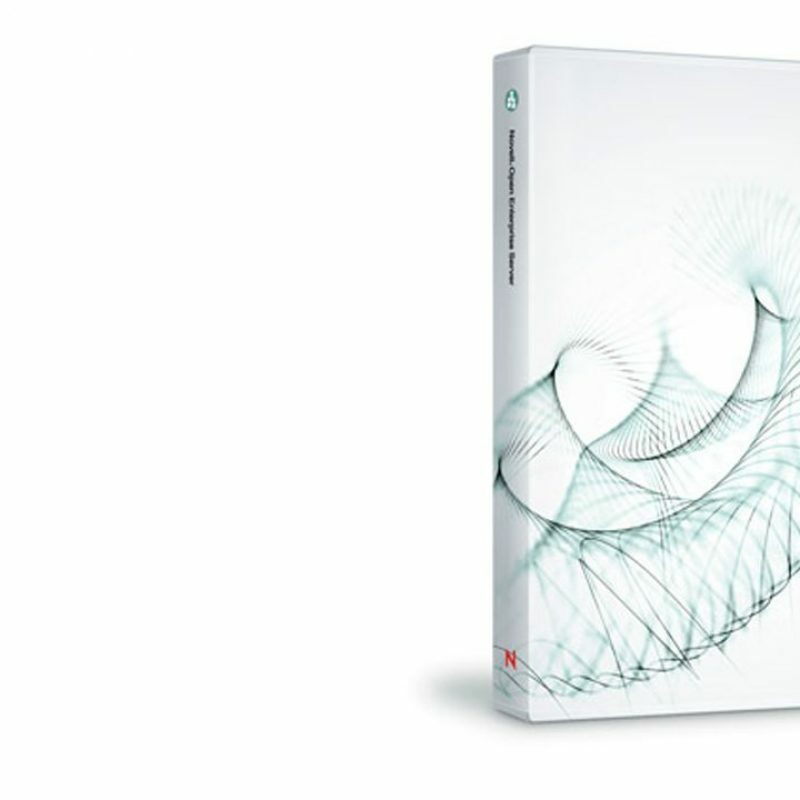 Archive and versioning services has been discontinued in OES 2015. Open Enterprise Server 2015 enables logins from AD users straight onto the Open Enterprise Server without the need of IDM or any means of synchronization. This means that users can work without using a Novell Client. In the traditional OES file access model, Windows and Linux workstations use the CIFS protocol for file access. Novell Client software for both Windows and Linux uses the NetWare Core Protocol (NCP) to provide file services. Macintosh workstations communicate using AFP or CIFS. To access NSS resources using FTP, Samba, SSH, and SCP, users must be LUM-enabled. 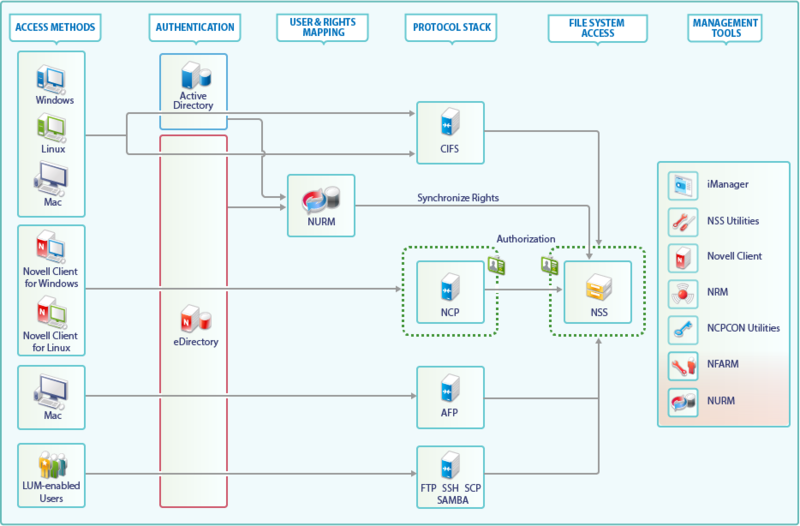 With OES 2015, Active Directory users can authenticate to Active Directory and natively access NSS resources using only the CIFS protocol. NSS file access for Active Directory users using NCP, FTP, AFP, and Samba is not supported. There is no change in the way how file access happens for eDirectory users. 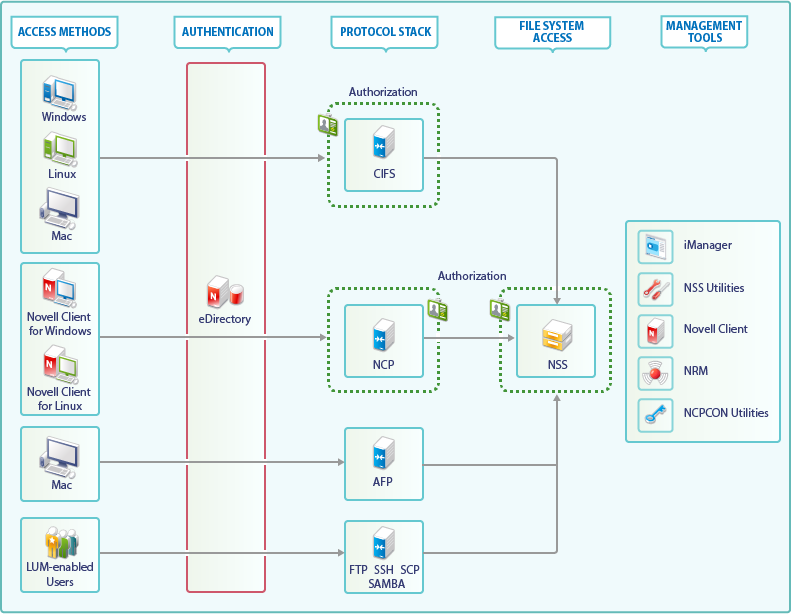 With OES 2015 both eDirectory and Active Directory are supported as an authentication source. For an Active Directory user authentication is controlled by the Active Directory using kerberos. For an eDirectory user authentication is still controlled by eDirectory. The Authorization for both authentication-methods still happens at the NSS level. With the NFARM Windows Explorer extension AD users can administer NSS resources on OES using Windows explorer. Just as they would with NTFS resources on Windows servers. For storage management the same tools as OES 11 are available: iManager, NRM (for DST policies, Shadow volumes etc), NSSMU and NLVM. NURM (Novell User Rights Management) this tool creates and saves the mappings of eDirectory and ActiveDirectory users to the NSS filesystem. NIT (Novell Identity Translator) This tool makes sure that eDirectory and Active Directory users are allowed to access NSS resources natively.